The Bazeley Partnership were engaged as Architects in St Mawes to design and manage the development of two new properties on the Fal Estuary, to replace a substandard building which was unsuitable for mobility and disability adaptations. The client sought an accessible design for the accommodation, which has been organised appropriately with a lift incorporated and a wheelchair accessible wet room provided. Level access is provided at entry to the house. 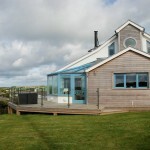 Both dwellings are modern in appearance; their most notable feature being the cylindrical stairwells and upper storey balconies which maximise the views across the Cornwall countryside. The exterior of each property features mixed cladding materials including slate, copper, cedar and traditional white render, giving each building a contemporary appearance.